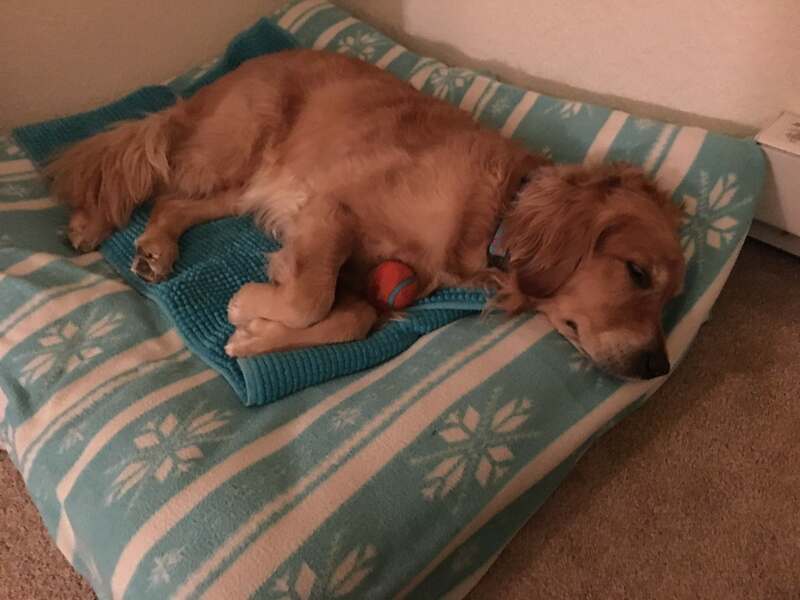 Cali’s favorite way to relax is curling up with her beloved tennis ball. Aromatherapy for dogs seems like an obvious idea, but it’s only recently been formally studied as a way to calm dogs in a stressful environment. A small study looked at the effects of four scents: Coconut, vanilla, valerian, and ginger, on dogs in a shelter / kennel environment, a noisy and stressful environment. All four scents were found to reduce activity and vocalization; coconut and ginger also increased the amount of time dogs spent sleeping. It was a single, small study, and I hope that more research is done on whether scents can calm dogs and which scents are most effective. I have some products that are intended to calm anxious dogs, but I don’t know that they’ve been particularly effective with my own dogs. One is lavender and chamomile. I’ve used T-Away, an essential oil blend, with Cali, and it sometimes calms her right down, but other times doesn’t seem to have an effect. I think the difference is whether she’s excited (no effect) versus anxious (seems to help a lot), but I have not done careful enough study to be sure. A DAP diffuser seemed to help with Jana’s anxiety, but again, my study of one dog doesn’t really say much about whether this is an effective treatment. But, given the way most humans respond to scents — some are calming, others are irritating — along with dogs’ sensitivity to scent, it seems likely that aromatherapy could work for many dogs. I’d love to see something as easy to implement as infusions of relaxing scents become a standard protocol at kennels and shelters, maybe vet clinics — anywhere that stressed-out, anxious dogs are likely to be found. Aromatherapy might also be a nice, easy way to help dogs with noise and thunderstorm anxiety. That would be a great direction for some additional research. I have a growing personal interest in this topic, as Cali has recently shown some anxiety during severe thunderstorms. I don’t think she’s reacting to noise, but rather to changes in air pressure or something else that started quite a while before the actual rain, thunder, and lightning. Melatonin helps, but it would be nice to have some other ways to ease her anxiety. A caveat: The scents that tend to be soothing to humans might not have the same effect on dogs, and scents that they find calming might be unpleasant to us. Even if that turned out to be the case, it would be interesting to know more about how scent affects dogs’ moods and energy or activity levels. In addition to calming them, scents could probably be used in other ways to work with dogs or influence their moods and behavior. I learned a lot about dogs’ sense of smell from Being a Dog by Alexandra Horowitz, but I don’t remember any mention of scent as a way to calm (or energize) dogs.